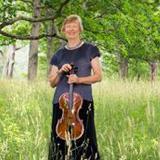 In addition to its concerts at the Garth Newel Music Center in Bath County, Virginia, the Garth Newel Piano Quartet has performed throughout the United States and on five continents. Repertoire for this concert consists of Louise Hérritte-Viardot’s Quartet No. 1 in A Major, Op. 9 Im Sommer, Mark Carlson’s Piano Quartet, and the Quartet No. 2 in G Minor, Op. 45 by Gabriel Fauré.